For the 24 hours to 23:00 GMT, the USD declined 0.25% against the CAD and closed at 1.3101 on Friday. Data released showed that Canada’s unemployment rate unexpectedly rose to 6.0% in June, defying market consensus for an unchanged reading. The unemployment rate had recorded a rate of 5.8% in the prior month. Additionally, trade deficit widened more than expected to C$2.8 billion in May, compared to a revised deficit of C$1.9 billion in the prior month. On the other hand, nation’s seasonally adjusted Ivey PMI increased to a level of 63.1 in June, compared to a reading of 62.5 in the previous month. In the Asian session, at GMT0300, the pair is trading at 1.3085, with the USD trading 0.12% lower against the CAD from Friday’s close. 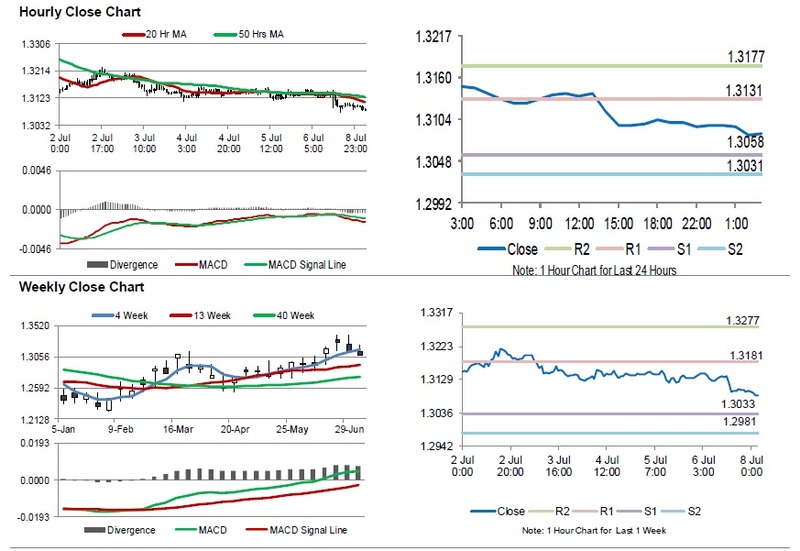 The pair is expected to find support at 1.3058, and a fall through could take it to the next support level of 1.3031. The pair is expected to find its first resistance at 1.3131, and a rise through could take it to the next resistance level of 1.3177. In absence of key economic releases in Canada today, investor sentiment would be determined by global macroeconomic events.